Joana Vicente is the Executive Director and the Co-Head of the Toronto International Film Festival. She previously served as the Executive Director of the Independent Filmmaker Project (IFP) as well as the Made in NY Media Center by IFP. Vicente is an Academy Award-nominated producer of over 40 feature films by acclaimed directors. Vicente is also recognized as a leading figure of the digital film revolution. Her pioneering digital production companies Blow Up Pictures and HDNetFilms, which she launched with partners Jason Kliot, Mark Cuban, and Todd Wagner, ushered in a new era of digital filmmaking that transformed the landscape of American independent film production and distribution. 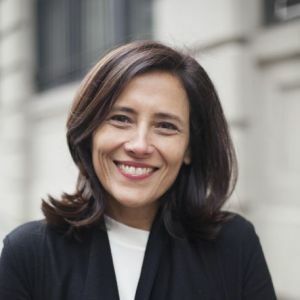 Vicente was named by Variety as one of the 60 Most Influential People in New York, and was named to Variety’s Women’s Impact List twice. She is a recipient of the “Made in New York Award,” which recognizes those who have made significant contributions to the growth of NYC's media and entertainment industries. Before turning her attention to film, Vicente served as a press attaché for the Portuguese delegate to the European Parliament and a radio news producer for the United Nations. Speaking at: The BANFF DEBATE: Media, Creativity and Technology: Thriving Ecosystem or Future Monoculture?